Upgradeitis has hit, so will be moving on to another machine. This machine is much loved, has been used for approx. 2 espressos per day. The Giotto has used filtered water only and is regularly backflushed and cleaned. 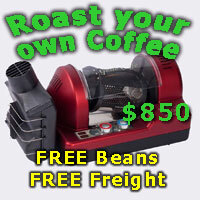 The machine was originally purchased from Talk Coffee who provided ongoing service. It has never missed a beat and reliably produces wonderful shots. It has several baskets and portafilters - see picture. maybe i am too late, but is shipping possible to sydney? Hi dozerz, unfortunately local pickup only - I have edited my post to make that clearer. I have decided to withdraw the pullman tamper from the sale package as it is still going to be usable with my new machine, apologies for the misleading thread title. Not sure how old the machine is - estimated 2009/2010. Last service - November 2017. How different is this to the Giotto's produced today? Does it have the PID under the tray? I'm assuming this is a vibration pump machine. Yes it is Vibration Pump. I believe is it premium plus model. I have just moved house, so can't access the original user manual (in boxes! ), however I will commit to posting it to new owner on sale. This looks like a Premium Plus V1. No PID but it does have cool touch steam and hot water wands. The V3 introduced a PID. I have a V2 which has the two pressure dials which I think is the main difference from V1. Yes, a workhorse is a great description. It just smashes out the shots! Hi all, price reduction to $1000. I need to move this along! If only it wasn't pick up only, I'd be on this.